It’s finally here! PROPHECY by Ellen Oh. I am beyond excited for this book and I have so much love for it and Ellen herself. I read an early draft of this book way back when Ellen and I manuscript swapped. She read GILDED and I read PROPHECY so it’s kind of an amazing thing to see our books debuting in 2013. 1. The setting– Hello, ancient Korea. It doesn’t get much better than that. So automatically, it hits my winner category. 2. The premise– Fighter girl who saves her people. My type of book. 3. 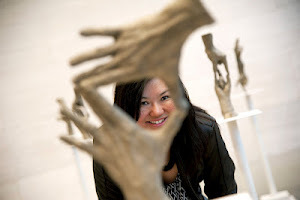 The Korean mythology– After writing GILDED, I find it intriguing to see how other authors pull the ancient myths into their own stories and Ellen does such a great job with this. 4. The cover– Tell me that’s not gorgeous. 5. The fight scenes– If you’re looking for a good action-packed quest with thrilling fight scenes, you really need to read this book. To stalk Ellen, you can find her on website, Twitter or Tumblr. Don’t forget to add PROPHECY to your Goodreads list! And get your own copy here to add to your bookshelf collection. Or make a comment below and WIN a copy for yourself. Tweet this post for an extra entry. I’m a big Korea fan! Congrats, Ellen! Hooray for Ellen! So excited for this book! And, I’ll add, the trailer was just fantastic too. Go, MiG Writers! That’s an awesome cover 🙂 An ancient Korean setting would be pretty awesome too! Sounds like my kind of book, and it would be super cool to see how the myths have been woven in. Congrats to both you and Ellen for having your novel debuts this year! Congrats to Ellen, and to you, Christina! Prophecy looks absolutely stunning. Loved the trailer as well. Good luck and enjoy your debut year! I’m dying to read it! Big congrats to Ellen! And I agree with Penguin, the book trailer was AMAZING!! I love “One girl will save us all.” Powerful statement. That IS an amazing cover! And it sounds like a great read. Aaaahhh! I’d love to win a copy of this! I think Korean culture is awesome. I loooove watching Korean Dramas and I like to eat kimchi (accompanied with meat, especially bite-size steak pieces) and I think K-Pop music is so fun (my 2 year old daughter sometimes have our own little dance parties). Thanks for this giveaway! I shared this via Twitter! EEEEKKK!! I forgot Prophecy has already been released! I’m really looking forward to reading this book! I love books that incorporate different mythologies! Diana- yes! Those are all great things about Korea. Thanks for sharing on Twitter! Woot woot! YAY for Ellen! She is such a nice person! 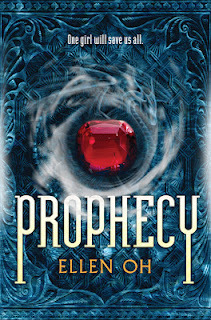 I have an ARC of this book, but I would love to win a copy of Prophecy. Been dying to read this one! Love that its from an Asian author. Thanks for the giveaway. Really excited to put this on Goodreads to read list! It is great to see some fun new fantasy out there.